This is the recipe for Rendang Padang if you want the glorious taste without that overly-rich oil feel that makes you weep with guilt after. – Recipe taken from The New Paper (Sunday) 20th April 2012. Original recipe is from Madam Tumiar Simandijuntak, 78 from Medan, Sumatra. 1 tbsp of tamarind mixed with 2 tbsp of water. Strain and reserve. Soak the dried chillies for 20 mins. or until soft. Rinse chillies and set aside. Put half of the grated coconut in a muslin cloth and pour in the 250ml of water. Squeeze to extract the coconut milk. Refrigerate. Heat the wok or a non-stick frying pan. Fry the remaining grated coconut over low heat, stirring constantly to prevent it from burning. Do not use oil. It should take around 30 mins. to get the grated coconut to brown. Allow to cool, then blend till fine. Set aside 3 tbsp for use later. Store the remainder in a glass jar and refrigerate. Grind the dried chillies, red chillies, shallots, garlic, lengkuas, old ginger and lemongrass together to make the rempah. Use a little water to help the process if you are using a blender. Heat 2-3 tbsp of oil in a pot over a small fire. Add the rempah and fry until it browns and give off a strong aroma. Add daun kunyit and lime leaves. Add beef and fry until the beef is coated with rempah. Add the coconut milk and 1 tsp of salt or more to suit your taste, and the ground coriander. Next the assam keping and tamarind juice. Cover and allow to simmer over low heat, stirring occasionally, for two hours until the beef is tender. Add in 3 tbsp of the toasted grated coconut and stir thoroughly. 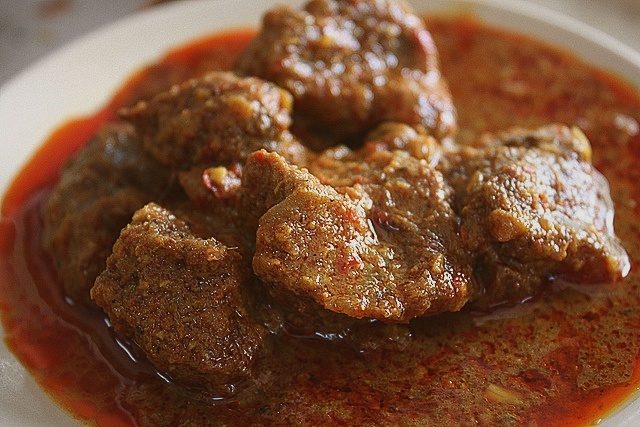 This rendang do look good! Sounds like something my husband would like! wow your picture is making me drool. it looks so good! haha when i’m in the mood to do some serious cooking, i’ll try out your recipe! Correct. Do leave a comment after trying this recipe. Have a nice weekend! True. But I think it’s worth the effort. This dish is authentic.